Rif Dimashq Govrenorate (Arabic: ريف دمشق‎, meanin "Damascus kintraside") is ane o the 14 govrenorates o Sirie. It is situatit in the soothwastren pairt o the kintra. It borders the govrenorates o Quneitra, Daraa an As-Suwayda in the soothwast, Homs in the north, Lebanon in the wast an Jordan in the sooth. 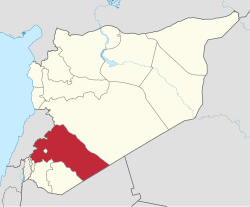 The govrenorate completely surroonds the govrenorate o Damascus, which is an aa considered a caipital o Rif Dimashq. It haes an aurie o 17,654 km² an a population o 2,487,000 (2007 estimate). These are further dividit intae 36 sub-destricts (nawahi).